Origin: the Salish tribe on Turnour Island in the Pacific Northwest. This mask was most commonly worn as a crest by ritualists who inherited special powers and assisted at all life crises and social situations, including birth, naming, and marriage. By myth the mask was associated with healing, and was worn by dancers who danced in groups of four. Under threat of war the Salish gave the mask to the Kwakuitl tribe who, in turn, used it in their ceremonies. 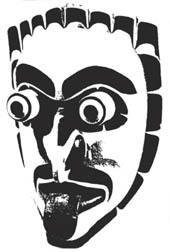 Some original Kwekwe masks can be seen at UBC in Vancouver B.C. Size 9x18 on 8x8 Plexiglas stand.